Since before I remember, I have always been interested in music. 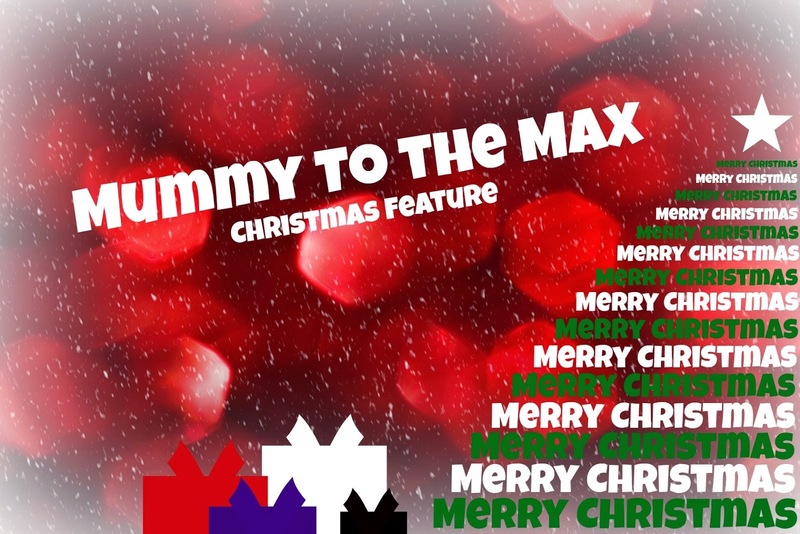 At night when Maxwell is in bed there is nothing I love to do more than turn music on, relax, write blog posts or even tidy and clean the house up. In the day time I adore listening to music, I love to listen to it in the garden, the conservatory and even in the kitchen. This Christmas I was sent a pair of Jam Transit Headphones as well as a Jam Rewind Speaker to review. At night when Maxwell is in bed I tend to listen to music in headphones. There is nothing worse than distracting a toddler, waking them up and having to get them back to bed. Listening to music in my headphone means that I can have the sound on low enough to hear Maxwell however at the same time I am able to listen to my music in peace and not get distracted. I was particularly excited to review the Jam Transit Headphones because they have so many great features included on them. What I did not know before reviewing these headphones was that they are not only great for music but they are also brilliant to use when using your smartphone device. Thanks to a built in speakerphone the headphones are great to move between music and calls. The Jam Transit headphones can connect wirelessly up to 30 feet to any Bluetooth device which is another great feature for them to include. 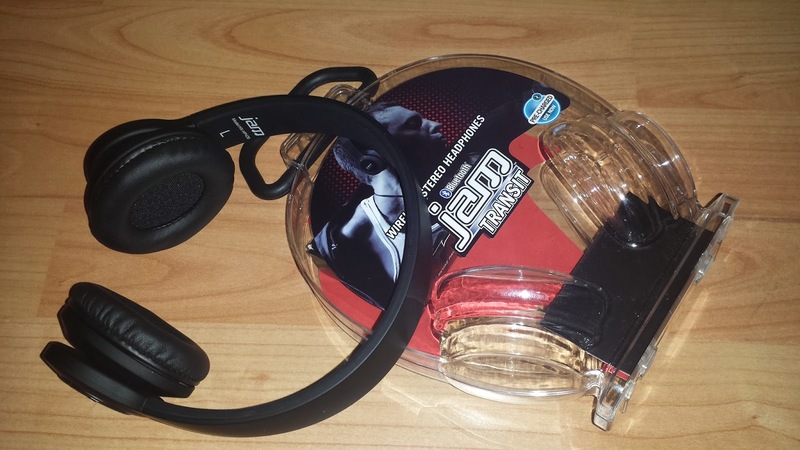 The Jam Transit Headphones are wireless free which in my mind makes them easier to wear. There is nothing worse than having a wire dangling down on your body and having to untangle the wire once a day. There's a full on ear remote functionality: You can FF/RW/play/pause/volume +/- at the touch of a button which is very convenient and easy to locate and use. The headphones also have a rechargeable battery that provides up to 11 full hours of play time. I loved using the Jam Transit Headphones and they are something which I will continue to use daily. I liked that the Jam Transit Headphones were rechargeable and the fact that they did not include batteries. I thought that the headphones were lightweight, sat comfortably around the ear and on my head and I thought that the wireless feature was brilliant. Priced at just £59.99 I thought these were reasonably priced. I often listen to music loudly throughout the day, whether Maxwell is around or at preschool he also enjoys listening to music. One thing which can get tiring however is taking my laptop round the house, it is a pain and something which can get annoying when having a toddler in tow. When the Jam Rewind Speaker came I was surprised by its appearance. If you were born in the 90's you may remember a thing called a cassette, if so the speaker was designed to look like one. The Jam Rewind Speaker has a reto appearance and is black and red. The Jam Rewind Speaker is compatible with all Bluetooth-enabled devices including smart phones and tablets, it connects wireless to devices up to 30 feet. This is a brilliant feature which means instead of taking my laptop from room to room, it means I can just take the speaker with me which is small and compact. The Jam rewind has 4 speakers and the sound from it is clear. The bass is good on the speaker and listening to music on the speaker is enjoyable.You are able to switch from song to song on the speaker thanks to easy to access buttons which can be found on top of the speaker. The Jam Rewind Speaker does not use batteries, instead it is rechargeable and it can last up to 8 hours. The speaker includes a light which shines red when the speaker needs to be recharged. The speaker also has voice prompts, the speaker announces its power and Bluetooth status. 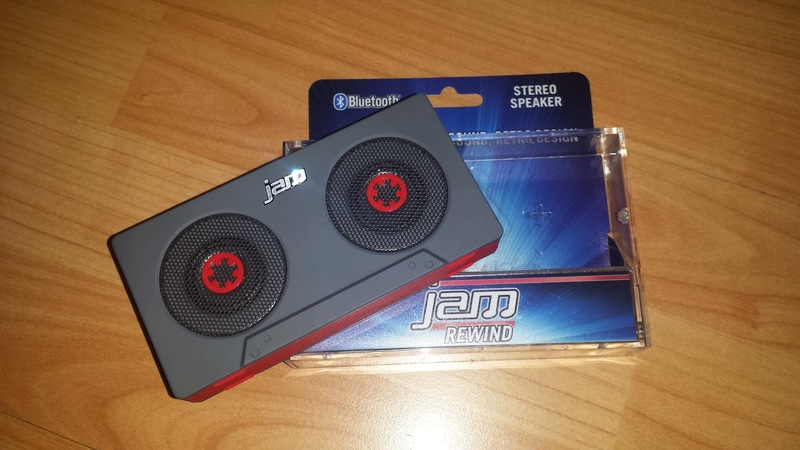 I liked using the Jam Rewind Speaker, it was easy to use and has many handy features. The Jam rewind has a RRP of £79.99 however at the present moment Argos are currently selling the Jam rewind with a 1/3 off making it just £49.99. I think my son would really love these, they look great!